We shall be obliged if you will remit to us the sum of 5s. 4d., which is owning to us as per enclosed statement. We shall also be obliged if you will settle the enclosed uniform account. The “enclosed uniform account” included such items as a lyre lapel insignia (2 shillings) and sewing White Star buttons on a tunic (I shilling). Altogether, Hume’s account added up to a grand total of 14s. 7d. – or about $3.50 in American money. C. W. and F. N. Black, who so diligently pursued their $3.50, were Jock Hume’s agents, and any entertainer or writer today who complains about his agent would do well to ponder the situation in 1912. He might find things are not so bad after all. Until 1912 the various steamship lines dealt directly with their musicians, signing them up as members of the crew like stewards, firemen, and ordinary seamen. The pay was union scale, which worked out at £6 10s. a month, plus a monthly uniform allowance of 10s. Then the Blacks entered the picture. An enterprising talent agency based in Liverpool, they promised the steamship companies a simpler and cheaper way to good music. One after another the companies signed contracts, giving the Blacks the exclusive right to supply bands to their vessels. The musicians still signed the ship’s articles for a token shilling a month (putting them clearly under the captain’s authority), but they were now really working for the Blacks, and could get no jobs except through the Blacks. Since the musicians worked for the Blacks or not at all, they had to take what the Blacks were willing to pay them-which turned out to be a sharp cut in salary. Instead of a basic pay of £6 10s., they now got only £4. Instead of a uniform allowance of 10s. a month, they now got nothing at all. The terms of employment were also hard: if the steamship company objected to any musician, the Blacks had the right to remove the man without any investigation or explanation. The Amalgamated Musicians Union protested without success. Only some of the bandsmen belonged, and in any case, these were not the times for strong union action. Finally, early in March 1912, a delegation from the union waited upon Bruce Ismay. As Managing Director of the White Star Line, Ismay was a mover and shaker in the British shipping industry, and maybe he could be persuaded to do something. The great Olympic was about to sail from Southampton, and the delegation pointed out that her five-man band was being paid at less than union scale, supplemented only by the monthly shilling that White Star paid to make them officially members of the crew. If the delegation expected to melt Ismay’s heart, they didn’t know their man. He replied that if the union objected to White Star carrying its bandsmen as members of the crew at a shilling a month, the company would carry them as passengers. Sure enough, when the Olympic reached New York on March 20, her five musicians were listed as Second Class passengers. All had regular tickets, and all had to appear before the immigration officials in the usual way. As a crowning irony in view of the reason for this masquerade, all had to produce $50 in cash to show that they were not destitute. The masquerade continued when the Titanic sailed. She, of course, had not only the standard five-man band, but the special trio added for the Cafe Parisien. Hence there were now eight extra names on the Second Class passenger list. Otherwise nothing had changed: the musicians still had the same cramped quarters on E Deck (next to the potato washer), and certainly none of the “perks” of passengers. When they played that last night, they played as disciplined members of the ship’s crew, not as a group of talented passenger-volunteers. It was natural, then, for the musicians’ families to turn first to the White Star Line for financial benefits under the Workmen’s Compensation Act. Sorry, said White Star, the bandsmen were Second Class passengers and not covered by the Act. The Line suggested that the families contact C. W. and F. N. Black, the real employers. Sorry, said the Blacks. The problem wasn’t their responsibility. They carried insurance to cover such matters, and any claims should be laid at the insurer’s door. Sorry, said the insurance company, the bandsmen were not workmen as covered by the policy. They were independent contractors, using the Blacks as a booking agency, and the insurance company was under no liability. With the legalities settled, the musicians’ union made a final appeal to White Star’s sense of moral responsibility: “Three families lost their only sons – three young men ranging from 21 to 24 years of age, cut off in the prime of their life while performing an act of heroism that stirred the whole world to its depths. Surely there is something for the White Star Company to consider over and above the mere terms of an Act of Parliament.” It did no good. 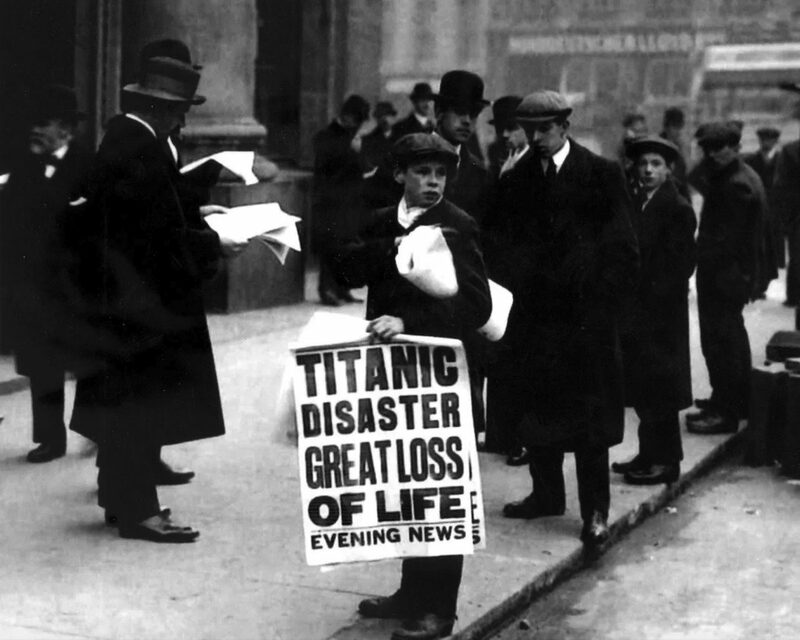 In the end, the day was saved by the “Titanic Relief Fund,” an umbrella organization that was set up to manage the charitable contributions that poured in from all over the world. 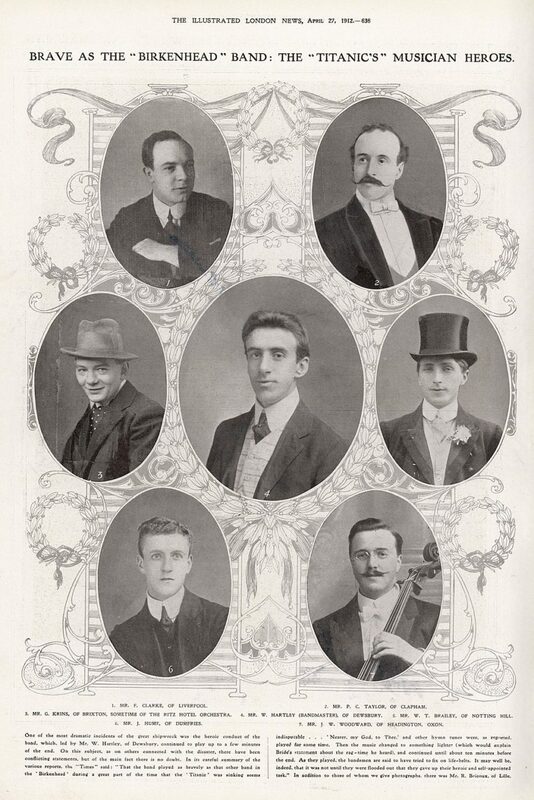 On January 2, 1913 the Fund announced that it would treat the musicians as though they were members of the crew. This opened the door at last to adequate benefits. Welcome news, but no thanks to the White Star Line. To the end it maintained, as far as I can determine, that the musicians were no more than Second Class passengers. While this shabby little business was unfolding behind the scenes, front-stage the drama of the band’s heroism continued. On May 18 there occurred one of those great public funerals, dripping with melancholy pageantry, that the Victorians and Edwardians did so well. Bandmaster Wallace Hartley’s body had been retrieved from the ice-strewn waters off Newfoundland, and now he was coming home to his final rest. 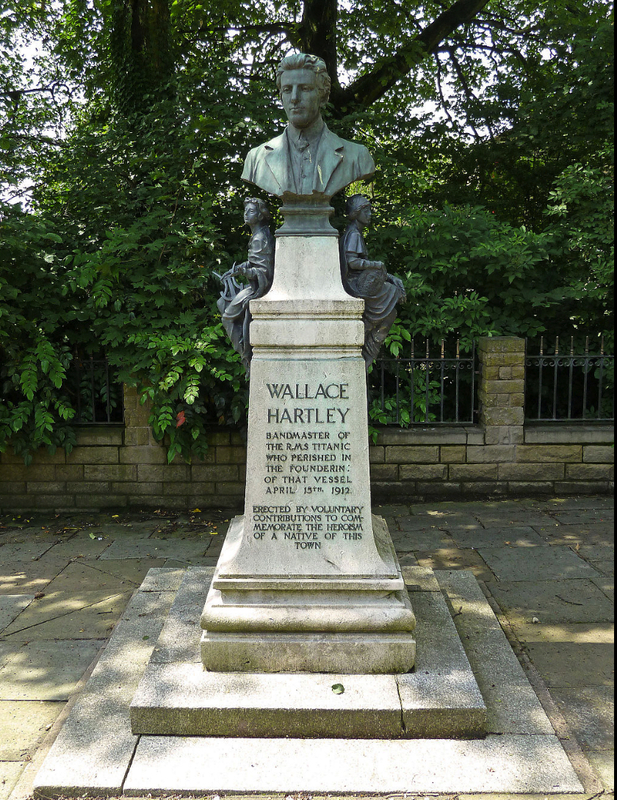 Seven bands played as his rosewood casket, borne shoulder-high, was carried through the winding streets of Colne, Hartley’s birthplace in the hills of Lancashire. Aldermen, councillors, ambulance men, police, boys’ brigades, and musicians from all over England fell in behind – the procession was a half-mile long. Thousands lined the route; most wore black or white, but occasionally there were mill girls in their drab shawls and miners in their blue overalls. All business had stopped for the day. At the steep hillside cemetery, as the casket was lowered into the grave, a dozen Boy Scouts raised their bugles and sounded “The Last Post.” The notes echoed off the neighboring hills, drowning out the squabbling and petty maneuvers for that day at least. 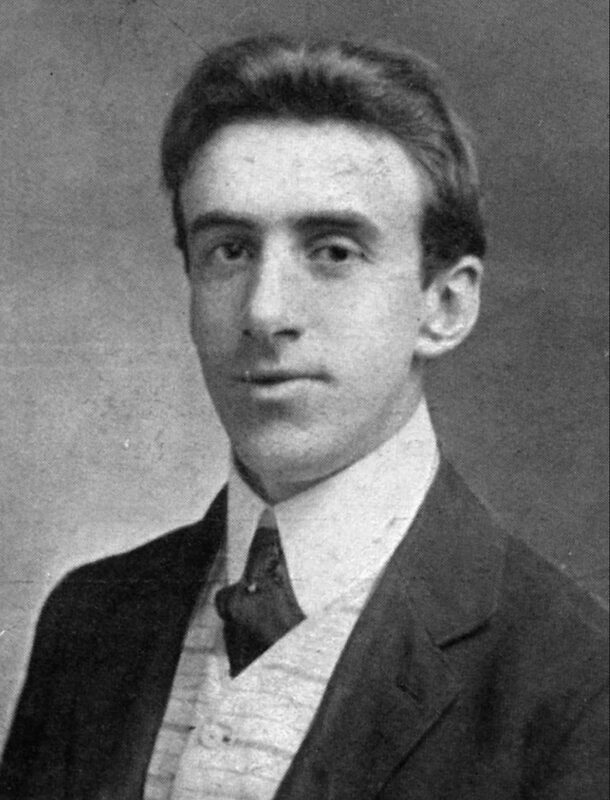 Wallace Hartley (Bandmaster & Violin). John Frederick Preston Clarke (String Bass & Viola). What music did the band play? Each year there is a remembrance on the anniversary of one of the greatest sea tragedies in modern history — The sinking of the Titanic at 2:20 a.m. on 15 April 1912. With the release of several popular films, especially the best one, A NIGHT TO REMEMER (1958), also the multi-Oscar-winning TITANIC (1997), there continues to be a dispute as to what was the last tune played on that fateful night when the Titanic sank within only a few hours and over 1,500 passengers perished, many of them never recovered. As it turns out, none of the films has the correct tune as the last one played on the Titanic. 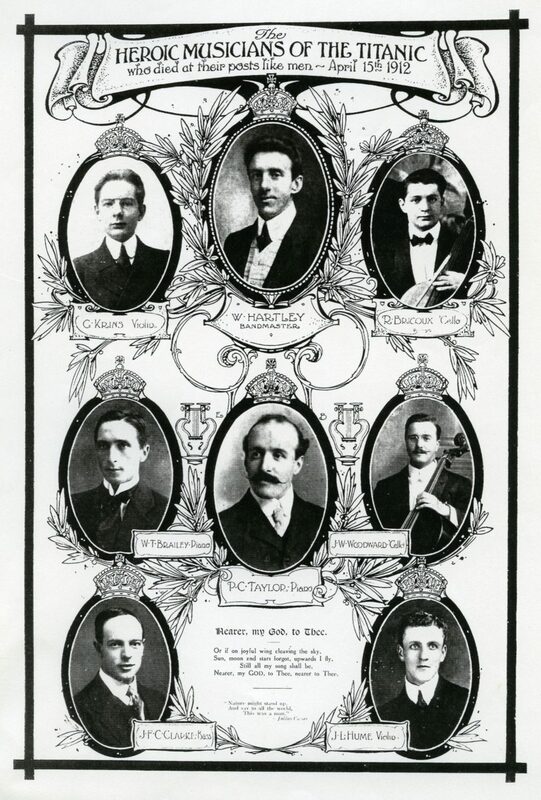 The Titanic had two different groups of musicians that played on that first and last voyage: a trio of violin, cello and piano who played just outside the A la Carte Restaurant and Cafe Parisien; and a quintet of musicians who played at other locations, led by violinist Wallace Hartley. All of them died when the Titanic sunk and today they are fondly remembered for their bravery, as they should be. What Was The Last Tune Played On The Titanic? The most popular claim has been the final tune played by the musicians was a hymn, either one titled “Autumn” or “Nearer My God To Thee,” which has at least three different tunes associated with it. The American version is Lowell Mason’s 1856 hymn tune, “Bethany.” This beautiful hymn tune by the “dean of American hymnwriters” who also composed the popular Christmas carol, “Joy to the World,” is the one heard most often in modern times and is the one played in the 1997 film, TITANIC. Another version is John B. Dyke’s 1861 hymn tune, “Horbury” — played and sung in A NIGHT TO REMEMBER. And a third version is Sir Arthur Sullivan’s 1872 Methodist hymn tune, “Proprior Deo.” Three great hymns by three of the greatest hymn writers of the 19th century. 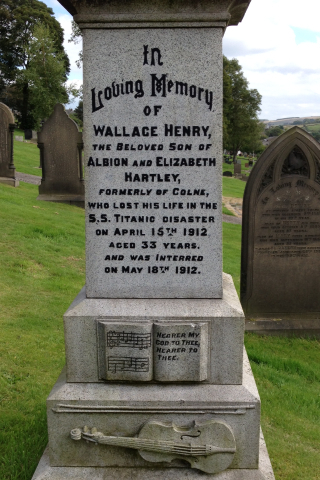 In her interesting book A Hymn for Eternity, Yvonne Carroll writes that “Proprior Deo” was Titanic bandmaster Wallace Hartley’s favorite hymn and was played at his funeral as he had earlier requested. But did Hartley ask his fellow Titanic musicians to play this hymn as the last tune before the Titanic sank into the ocean? Probably not, though it makes for a very touching story. According to the authoritative book by Walter Lord, The Night Lives On, it was NOT a hymn but a popular waltz tune that was played as the final number by the Titanic musicians. That tune was “Songe d’Automne (Dream of Autumn). How ironic this lovely melancholy waltz would be played as the last tune! “Songe d’Automne,” was generally known simply as “Autumn.” Composed by Archibald Joyce, it was never very popular in America, but was a major hit in London in 1912. Played at roller-skating rinks, cafes, and the like, Harold Bride would probably have known it, and he might well have assumed that his American interviewers understood what he meant. Certainly Bride never referred to “Autumn” as a hymn in his original interview of April 19. He specifically mentioned the tune three different times, but always casually, like a popular song that needed no further explanation. Why did some passengers claim to have heard “Nearer My God To Thee”? One reason might be it seemed an appropriate tune to play at that time of desperation and loss. Another possibility is that “Songe d’Automne” would have been played at a slow tempo and therefore could have been mistaken for the hymn tune. Whichever tune was played, and it will probably never be settled conclusively, both “Songe d’Automne” and “Nearer My God To Thee” are wonderful tunes and should be played in connection with the Titanic. This entry was posted on Wednesday, April 17th, 2019 at 10:00 am	and is filed under General Interest, Uncategorized. You can follow any responses to this entry through the RSS 2.0 feed. You can leave a response, or trackback from your own site. Thank you for this story! There were so many things done wrong by The White Star Line which really sunk The Titanic before it had a chance at achieving a safe trans-Atlantic crossing. The treatment of these brave, talented musicians does not surprise me. The Blacks agency behavior was much worse-because they did nothing in service to their clients-the musicians. The Blacks inappropriately saw only the cruise lines or other such businesses as actual clients. “The Last Post” in Lancashire is a magnificent chapter in the history of The Titanic. I hope even more will come out about as we study the Titanic.